I've got quite the soft spot for the City of Angels. About 11 years ago, as a fresh faced 24 year old, I spent a life-changing, world-view shaping 10 months volunteering at the Los Angeles Dream Center, a community organisation serving some of the most marginalised and vulnerable people in America. I got to know the city pretty well during this time, and met lifelong and wonderful friends whom I have consistently visited over the years. This has meant that I've dropped into LA once a year or so, to visit old haunts and hug friends, giving me the opportunity to see the city change quite a bit over the past 10 years. I feel like LA is one of those cities that polarises opinion. Most travellers either love it or hate it - sometimes with good reason. But I promise - that's not the LA I know. In recent visits to LA, I've noticed a change in the air. The same old crazy LA traffic is still there, and so are the tourists and tourist traps. But even 10 years ago, there were hints, glimpses of the creative and cultural renaissance that is now in full swing in LA, spurred on by burgeoning tech and social impact movements in a city already full of creative, talented (and yes, very beautiful) people. There are still plenty of issues to be solved in LA, and it's by no means a perfect city (which one is?) but there's definitely more to this place than meets the eye. The list below isn't exhaustive, but here are a few of my favourite haunts in the beautiful, sunny and colourful city of Los Angeles. I hope it helps you grow to love it as much as I do. My Disneyland... happy as Larry with all my purchases earlier this year @ the Rose Bowl Flea Market. 2 pairs of vintage trousers, 2 dresses, a tray, a wood carving and a few records for $120. WINNING SO MUCH. I am not joking when I say that the Rose Bowl Flea Market is my Disneyland. Back when I lived in Australia (and even now that I live in Seattle), I planned my trips to LA around the second Sunday of the month, in order to make it to the Rose Bowl Flea Market. This market continues to grow - you can't even get through the whole thing in one day, so I just pick a few favourite areas and do a loop or two. Even if you're not looking for vintage clothes, furniture or bric-a-brac, there's plenty to see and eat, and it's a fun (and relatively cheap) way to spend the day and see a semi-secret treasure the locals love. Bargaining is appropriate and I recommend bringing a bottle of water and a cart or your own grocery / tote bags as not all vendors have them. Go early (before 8am) or do what I do and go later in the day around 1pm, once the vendors are starting to think about heading home soon (Pro tip: I find vendors are generally more open to bargaining after they've made some money and are thinking about how much stuff they have to pack up. Strategy people, strategy!). Although not originally from LA, this particular outpost of the Chicagoan coffee company was one of the first "third wave" coffee places to make its mark on the city. You're guaranteed to get a great serving of espresso here, and for the Aussies looking for a flat white - they know their stuff so you're safe in their hands. Order a Gibraltar and a matcha pastry, and sit in the courtyard and enjoy the Moroccan tiling and "young Hollywood" talent spotting. Cafe Stella is next door if you need a more substantial bite to eat (and they get their coffee made at Intelligentsia and walk it over). Back when I lived in neighbouring Echo Park, this was a favourite spot to grab a coffee before wandering the new, cute boutiques that were opening up in the area. Now an established hipsterdom, it's a really fun area to explore that most tourists won't hear of in their "Homes of the Stars" tour brochure. Amoeba lays claim to being the world's largest independent record store, and you can honestly spend hours browsing the two storey monstrosity for old and new music, movies and merchandise. I certainly did when I was a poor non-profit volunteer with some free time and not much cash - heck, I still love wandering their rows and rows AND ROWS of titles, discovering artists and movies I've never heard of, or re-discovering old records my dad used to sing along to in the car when we were kids. After you've had your fill at Amoeba, head over to the Arclight Cinema's Pacific Cinerama Dome for a movie in this gorgeously designed and iconic theater. Seats are reserved so you don't have to rush, and you can sometimes catch industry identities doing Q&A sessions after screenings of their movies. 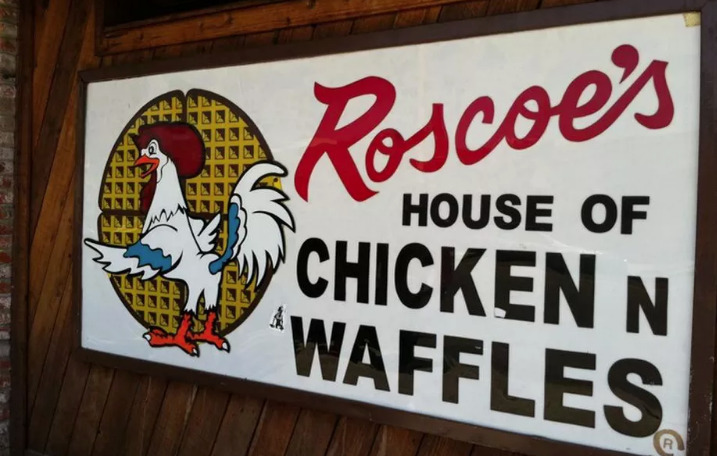 You haven't lived until you've eaten the crispy, perfectly seasoned goodness that is the fried chicken from Roscoe's House of Chicken and Waffles. One of my must-visit places, I ate here weekly when I lived in LA. Start out traditional with the fried chicken and waffle, but if you're feeling fancy, do yourself a favour and get the Number 5 (Jeannie Jones fried chicken omelette), or the Number 21 (Fried Chicken thigh with red beans and rice). And cornbread. And the Red Rooster Louisiana Hot Sauce. And Sweet Tea. And... and... just go. I promise it's worth it. Ok so I said no touristy stuff. But you can't be in LA without checking out how the locals shop, and these two stand out among the rest because of their LA-ness and also the fact that you can go there and just wander around without spending a penny. Complete with European village style walkways, garland lights and massive outdoor fountains that move to music every hour, The Americana and The Grove are the epitome of LA fabulousness in all its glory. Love it or hate it, Los Angeles knows how to shopping mall. Walkway to The Grove on a clear November evening.